These are the stories of Asians who were expelled from Uganda during the government of Idi Amin in the 1970s, and who eventually settled in the UK, particularly Leicester. By turns surprising, uplifting and tragic, these stories throw a new light on events in recent history which have done much to help shape the multi-ethnic, multicultural nature of today’s society. 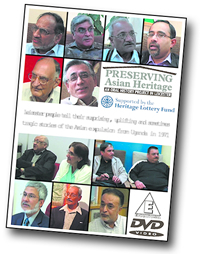 Research, interviews, filming and DVD production were carried out by a team of enthusiastic volunteers from Leicester; interviewees were, at the time of filming, residents of the Leicester and Birmingham areas.